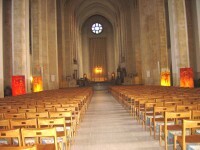 Christ images strike a chord…..
A DRAMATIC display of 12 giant oil paintings inspired by the crucifixion of Christ line the nave of Guildford Cathedral. Penny Warden’s disturbing compositions, entitled The Phoenix Series, come to Guildford on a national tour of cathedrals that started in 2000.Pictorial variations on a suffering central figure, painted life-size and daubed and splattered with paint, they must have jarred the sensibilities of many congregations but clearly struck a chord, as praise from past venues proves. As the overall title suggests, despite the unsettling imagery, the paintings are underpinned by a moving and life-affirming optimism. This is mainly due to the Penny’s dynamic approach. Controversially, the central figure of the stripped and crucified Christ is painted without the cross as a kind of everyman – and sometimes as an everywoman.” I work almost life-size so the viewer can enter into my paintings,” Penny said. “The paint is flicked, splattered and destroyed again and again. This way I am more likely to produce uneasy figures that show their sufferings.” The attitude of the faceless figure scarcely changes from painting to painting and the awkwardly angled defeated body has a powerful pathos. Penny’s vigorous approach charges it with a new energy, however, which suggests that all is not lost. A cry from the heart, the paintings communicate both an oppressive feeling of violation but also of the essential indestructibility of the human spirit.